A genus of several species, natives of Europe and Asia. Type species: Dactylis glomerata L.
Dactylis glomerata L. Sp. PI. 71. 1753. Culms 2°-4° tall, tufted, erect, simple, smooth and glabrous. 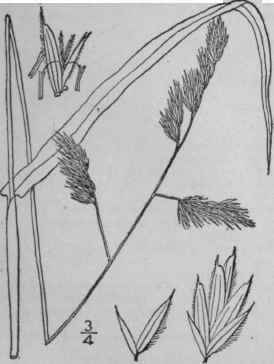 Sheaths shorter than the internodes, smooth or.rough; ligule 1"-2" long; blades 3'-9' long, 1"-3" wide, flat, scabrous; panicle 3'-8' in length, the branches spreading or ascending in flower, erect in fruit, the lower l'-2 1/2' long, spikelet-bearing from above or below the middle; spikelets in dense capitate clusters, 3-5-flowered; lower scales 1-3-nerved, the first shorter than the second; flowering scales 2"-3" long, rough, pointed or short-awned, ciliate on the keel. In fields and waste places, New Brunswick to British Columbia, south to Florida and California. Naturalized from Europe and cultivated for fodder. Dew- or Hard-grass. June-July.